This pack uses Colorfoil, a low cost tooling foil that is silver-colored on one side, gold-colored on the other side. Use either side for these projects. 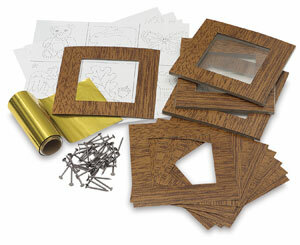 Kit includes 48 woodgrained 6" cardboard frames, a 4½" wide × 20 ft long roll of Colorfoil, 50 large-head nails, pattern sheets with 6 different 4" designs: Butterfly, Rabbit, American Eagle, Teddy Bear, Oak Leaf, Welcome House and instructions. Makes 48 projects.